Today was one of those agonizing high school teaching days. Midway through my load, I determined to head for Waxahachie as soon as I could clear my campus. I’m glad I responded to the impulse. I found a comfortable, well-lighted window table at Zula’s Coffee in the historic Roger’s Hotel on the town square, and resumed work on this old abandoned store I found in the Mississppi River town of Winfield, Missouri, northwest of St. Louis on old Highway 79. I’m nearly finished with the work, and will gladly post the finished result as soon as it is ready. Hope others enjoy looking at it as much as I enjoyed watching it emerge from the paper this afternoon in the overcast light of a weary Texas weekday afternoon. A Mississippi River town northwest of St. Louis on Old Highway 79. I spotted this old abandoned business while on a road trip last summer, and decided to commit it to watercolor. The Weiler House Fine Arts & Antique Gallery now solely represents my original watercolors in the Fort Worth and Arlington regions. They are located at 3126 Handley Drive, Fort Worth, Texas, 76112. Currently they are displaying nine of my works, five of them framed and four matted. I’m proud finally to have Fort Worth representation. My thanks goes out to Bill Ryan, owner and proprietor. 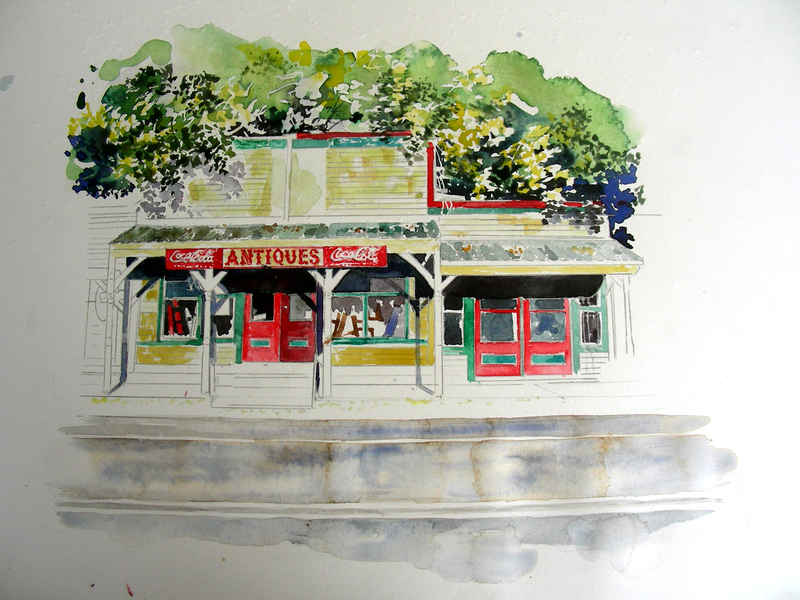 Weiler House Fine Arts & Antique Gallery now carries my original watercolors in the Fort Worth and Arlington area. I’m profoundly honored to receive this award. This show will hang till December 21, and I cannot say enough about the quality of the works on display. Two spacious galleries are filled to capacity. It was splendid to see the works of Tina Bohlman, Kent Brewer and Steve Smith again. And our judge has now decided to join the ECAA as well. She and her husband are both very accomplished professional painters. I’m thrilled to be associated with these kindred spirits. My watercolor "Cold Desolation" won Best In Show at th ECAA Annual Membership Show that hangs until December 21.